WordPress 4.4 added the much anticipated JSON REST API. It is great for plugin developers, but many site owners may not find it useful at all. In this article, we will show you how to easily disable the JSON REST API in WordPress. Why You Need to Disable JSON REST API in WordPress? 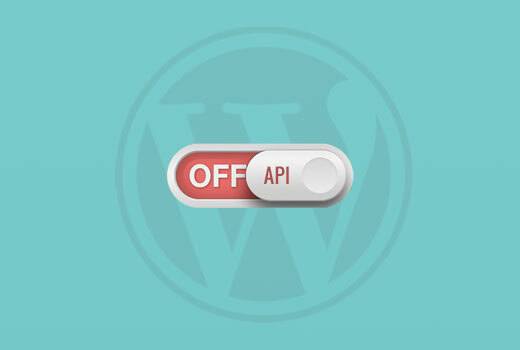 There is no denying that the API will bring lots of benefits for WordPress developers. The API makes it super easy to retrieve data using GET requests, which is useful for those building apps with WordPress. However, most site owners may not be needing those features at all. Having that said, this could potentially open your website to a new front of DDoS attacks. It can be resource intensive and slow down your website. It is similar to disabling XML-RPC, which many site admins disable on their WordPress sites just to be on the safe side. First thing you need to do is install and activate the Disable REST API plugin. For more details, see our step by step guide on how to install a WordPress plugin. The plugin works out of the box and there are no settings for you to configure. It will now forcibly return an authentication error to any API requests from sources who are not logged into your website. This will effectively prevent unauthorized requests from using the REST API to get information from your website. You can test this by visiting http://example.com/wp-json page. Make sure you logout of WordPress admin area first or switch your browser to incognito mode. Don’t forget to replace example.com with your own domain name. You will see this message, indicating that REST API requests are blocked. That’s all, you have successfully disabled unauthorized REST API requests on your WordPress site. 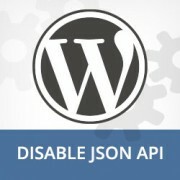 We hope this article helped you learn how to Disable JSON API in WordPress. Security conscious users may also want to checkout these tips on protecting WordPress admin area. Similar to an above commenter, I’ve noticed the “wp-json” request when using Pingdom and other testing sites. Unfortunately, mine takes over 10 seconds (Yes really!!) to load it. This pushes my overall website load time and I can’t figure out how to fix this. The plugin doesn’t change it at all. Any suggestions? How do I know if I actually have JSON API on my website? This article about removing it is good – if I need it – but I have often been alarmed by certain warnings only to find that they’ve not even applicable to me. If you are using a self-hosted WordPress.org site, then you do have JSON REST API available on your website. I hate adding yet another plugin to do a simple tasks, and I found that we can disable this functionality by adding the following code snippet to the functions.php file. Thank you bro, your answer is what I was looking when visiting this page. Thank you! Straight to the point. I was looking for this code, it worked, thanks, I don’t prefer adding plugins. Thanks for your help. There is no ‘add new’ option in my plugins. You are probably using WordPress.com. Please see our guide on the difference between self hosted WordPress.org vs free WordPress.com blog. This is for self hosted WordPress.org sites only. How can I check if my site has Rest API. I turned off a lot of extras when I first set it up but now don’t know where to look to see if it’s there. Not keen to download a plugin unnecessarily. What about the option to disable json rest api in Jetpack plugin? Is disabling REST API suitable for e-commerce sites such as WooCommerce? My understanding is that WooCommerce uses REST-API quite a bit. Further, my buyers do not have to login to buy, so what happens to the transaction when a REST API call is rejected? Plug-in makes no difference for me in WP 4.7.2. With the plugin activated or disabled, the example.com/wp-json (with my domain replacing “example”) pages gives a massive list of settings for my site. Hmmmm. Now that I look at it, I only see the list in Safari, while Chrome and Firefox for Mac show the expected message specified in this post. Make sure you are logged out of WordPress admin area or use incognito mode before testing the example.com/wp-json page. The plugin disables access to the page only for unauthorized users. As an administrator you will still be able to see it. Embarrassed… You are right, of course. First off thanks so much for what you do! I’ve learned so much about WordPress from you and sent a ton of folks your way!! Ok, I installed the plugin, but I am not seeing what you suggest above? I have a full screen of information…? Please logout or use incognito window to test. The plugin only disables access for non-logged in users. I followed these steps, but when I went to check it with the example etc., I got 2 pages of code, not the response showed above. Hmmm, don’t know what to do. Alright, I did it again and got the right message. Thanks! Works perfectly when I check using an incognito window. Thanks for the explanation regarding authorised vs unauthorised or anonymous users. Thanks for the tip as well as for the hook to disable XMLRPC. Is there a chance for a filter hook for the REST API as well? When I check the speed of my site using pingdom.com, the first html entry that tried to load shows the link as mydomain.com/wp-json and it has over 2 seconds of “wait” time. Is this the same as what this article is talking about? I’m hesitant to simply disable it since I would assume it will be used in the future. Any idea why it would add a 2+ second delay to loading anything on the page? Hmm, the REST API is going to become the standard way for plugins and themes to make Ajax calls back to the server from the front end, replacing admin-ajax, so I wouldn’t be disabling it… Hopefully they will fail gracefully, but you will almost end up missing some functionality. Also, if you really want to protect against DDoS attacks, you better disable html as well! ver 50,000 WordPress websites have been hacked due to a major security vulnerability that was discovered in the WordPress REST API. That’s disturbing to know. I have noticed a LOT of access attempts in my site’s logs. I think the folks at WordPress could have done a little better in letting the users decide how much, if at all, they want the REST API exposed. More of this, “The developers know MORE about the user’s needs than the user does!” – I also was not too happy about being forced to support EMOJI and remote-loaded fonts from fonts.google.com, even though my sites do not use them! The REST API may be a boon for (some) actual web-application developers, but what about the rest of us who will not very likely use this? ? ? How likely is it that a plugin will be using this functionality. Just for example would contact forms be utilizing this? Not keen on turning it off in case it breaks anything. The plugins will most likely notify you if they will be using it and you have it turned off.